Abe is a philosophy professor, brand new to a small Rhode Island university, but mired in a personal downward spiral. He's the Woody Allen character, except he really isn't. He's not witty, he's not neurotic, he's not even pessimistic. He's just depressed, and that makes him not very funny. He doesn't have any one-liners, no brilliant observations about life or death, just a melancholy attitude born from his self-loathing philosophies. Combine that with the really slow pace, and most Woody Allen fans will be put-off. But don't despair. The comedy is introduced with Jill (Emma Stone) and the other students and teachers at the university. They are all infatuated with the new professor; they all have stories about what happened and why he came here; and they all love him before they've even met him. And each story is more elaborate than the last. Stone had great delivery of her long-winded accolades and exaltation. Particularly funny when her boyfriend would interrupt her to either remind her that he's her boyfriend or that she only knows Abe as a professor. Lantos © 2015 Gravier Productions, Inc., Courtesy of Sony Pictures Classics. The movie can seem very disjointed with Phoenix's character acting in a drama and Stone's character acting in a comedy. And they both narrate the story that is about to unfold. Luckily the story that is about to unfold is a rather ingenious take on ideas that Woody Allen has presented before. Let's just say the professor-student love affair is downplayed and there's a murder! And that's a good thing. Interestingly enough the comedy picks up once the murder plot is introduced. It's not laugh-out-loud funny, but the various logic tricks that Abe and Jill are playing with themselves is funny; the absurdity of the existentialism is funny, and luckily the direction the plot takes is interesting. 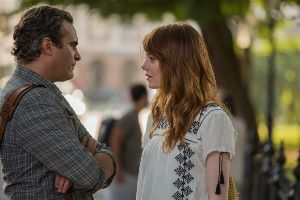 It's a very different world that Allen has created in Irrational Man. The small-town New England liberal arts college setting is beautifully photographed by cinematographer Darius Khondji, it's just the characters that don't seem to fit together. But then again, Woody Allen has always shifted from drama to comedy to murder mystery; this time he's just doing it all in one movie. Magic in the Moonlight (2014) - A whimsical air of love and magic.